Welcome back comic readers. I am back with another review. I chose this next title because it was offered for free on Comixology and it is a project by Marc Silvestri. Silvestri is probably one of the best artists to come out of the nineties and have his work still stand up. Big surprise to me that Silvestri was actually only writing this relaunch of his nineties series. 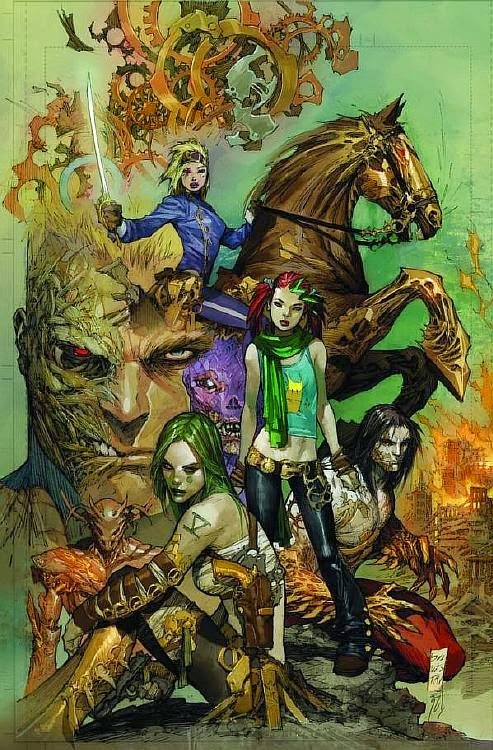 Cyberforce was originally a series back in the nineties when Top Cow/ Image were just getting started. The series I read however is a relaunch of the book that Marc Silvestri got funded through Kickstarter. The entire first arc was released issue by issue for free. This new relaunch begins with a young girl named Carin narrating the story as her and her dog Ninja are on the run from a group of Shoc Troopers. It isn’t made clear as to why they are chasing her, but it is obvious what they plan to do to her if they catch her. And they do eventually corner Carin, But her dog sacrifices himself to give her the chance to get away. It is at this point that the characters from the original series of Cyberforce start to appear. All of the members of the original series are in hiding because they have been branded as terrorsists by the current government. There is Heatwave, Cyblade, Boomer, Ares Prime, and Ripclaw. And they are wanted for the attempted murder of Carin’s mother, who is the wife of the head of a major company. So it is safe to assume that the group don’t trust Carin very much. However Carin knows that they are her only hope of finding the man that can help stop a coming disaster, Morgan Stryker. Stryker is their former leader, but has not been heard from for a long time. Some say Stryker is just a myth. The group doesn’t trust Carin so they inprison her while they decide what to do about the fact that she has seen them and knows where they are. While the group decides what they are going to do Carin escapes with some help. But by the time the group discovers her escape the shoc troopers hit their hideout leaving only a few alive. The attack on the hideout is pretty explicit. Not overly so, but it gets the point across that the shoc troops are not taking prisoners. This is when it is revealed that Carin’s narration is actually her being mentally interrogated by the head of the security force of her parents, who is later to be revealed as a former member of the team himself. Through this interrogation Carin explains how she got the information about the coming destruction, and that it is being planned and helped by her father the chairman of Cyber Data Industries. Before they get too much about what Carin knows Ripclaw, who went looking for the escaped Carin before the attack hit, helps to get her out of the building. Once out of trouble the two return to the rest of the group to find them all wiped out. Ripclaw takes this especially bad because Cyblade was his wife and they had a child within the camp as well. They also find a single survivor to the attack Ares Prime. It is at this point that Ripclaw decides to take Carin to see Stryker. Though it is clear that Stryker is not a popular person to any of his former teammates. After yet another battle with some troops and Carin’s former bodyguard Aphrodite V, they find Stryker. Or should I say Stryker finds them. But after he helps them he goes to leave them, wanting nothing to do with the trio. This frustrates Carin to the point that she reveals her true link to Morgan Stryker. Marc Silvestri really took a very nineties concept and brought it to fit in the more modern setting. The members of Cyberforce are all way more explained with a cyberpunk feel. It is that aspect that made the series work. I went into reading this without having read anything that came before. I had heard of Cyblade and Ripclaw, but knew nothing about them. Even with my lack of knowledge I understood who the characters were and where they stood in the grand scheme of the world within moments of being on panel. All of the characters are given clear voices and personalities. Khoi Pham has a beautiful style I didn’t expect. And Pham’s art compliments Silvestri’s writing perfectly. The layouts are really easy for the eye to follow and all of the characters and have unique looks making them easy to tell apart. And when the action hits the high points Pham’s art keeps the beauty while taking on a fast paced rough feel. I found this volume to be a really good read. It had an interesting story that wrapped itself up by the end. I don’t know whether I have any interest in reading on from this point, but I am happy I gave this book a look. As always thanks for reading my review. If you have any questions or comments please leave them in the comments section. So till next time. Keep reading fellow comic fans.